How Does Mold Get on the Glass and in Your Car? Mold spores are able to enter into your car via the air vents. Those spores can then land anywhere inside the cabin of the vehicle, including the auto glass. As soon as the spores land on their victim, the organism gets to work and begins decomposing it. Although you may be able to catch the problem early on, this isn't always the case. When mold takes over your vehicle and its glass, auto glass replacement may be your only option moving forward. • Every once in a while, make sure that you roll all the windows down in your car. If you have a sunroof or a moon-roof, open it as well. This will allow air into the vehicle for full ventilation. • Make sure you also turn on the heat and defrosters periodically. 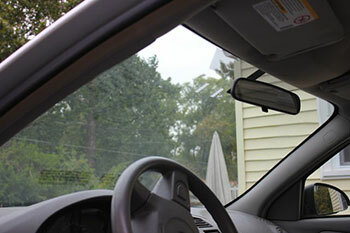 • Avoid letting the inside of your car get and stay wet – even the slightest bit damp. If any condensation builds up or a liquid is split, it needs to be soaked up immediately with a towel and then allowed to air dry. • Make sure all food is vacuumed up frequently. • Make sure to carefully inspect the interior of the windows for any pooled condensation. • You should also examine the window seals for any tears or cracks. These will need to be replaced if damaged. • Make sure you also use a flashlight and examine all interior surfaces for mold growth. This is particularly true for seat and floor mats. If you notice significant condensation build-up or even mold growth on the inside of your auto glass, you can use a disinfectant to wipe it down. Usually, this will take care of it. However, if mold is growing in the seals of the windows, then the mold may have taken over your entire door. This could require the door panel needing to be removed and cleaned along with auto glass replacement. If mold has infested your vehicle and auto glass, you are better off not even attempting to clean it on your own or drive the vehicle. If you notice a serious mold problem, you should give us a call at Only 1 Auto Glass immediately so that we can examine the glass and determine the appropriate treatment.